Fine Art Shippers offers a variety of fine art shipping services in New York, London, and throughout the world. Our team is proficient in shipping large paintings, stone and metal sculptures of any size, art installations, museum exhibits, antique furniture, musical instruments, and a whole range of other valuable and fragile items. However, now we are happy to offer one more exceptional service that will make our art moving company unique. We are talking about the Banksy wall removal service, which is actually in high demand these days as many new murals by the world-known British graffiti artist continue to appear all over the world. The process of shipping and moving Banksy walls is always a big challenge, even for specialist art moving companies with many years of experience. Nevertheless, while this process is highly complicated, it is also very interesting and exciting. Besides, it is just an excellent opportunity for art shippers to apply their skills and knowledge in a full measure to their job. However, before any mural can be moved, it should be first extracted from the wall of the building. This is where our Banksy wall removal service comes into play! It is needless to say that the Banksy wall removal process requires teamwork from everyone involved. After all, even experienced art handlers cannot cut the mural out of the wall safely without the help of professional builders, engineers, art restorers, and steel manufacturers. For this reason, Fine Art Shippers works with true experts in different fields to ensure that every step of the Banksy wall removal process is done with the utmost professionalism and precision. For today, our team is responsible for the Banksy wall removal in Brooklyn, NYC. As you probably know, several gorgeous murals by the elusive artist appeared in Midwood this spring. 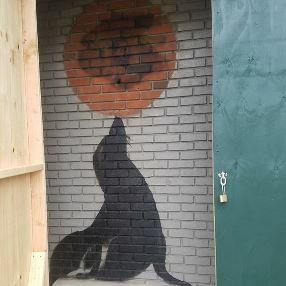 While one of them was soon destroyed, another depicting a seal with a ball will be extracted from the wall by Fine Art Shippers and moved to a secure place. We are very proud and happy to be part of the Banksy wall removal process and help the building’s owners preserve this new masterpiece of contemporary street art. It is indeed an exciting experience for our team and also a fantastic opportunity to demonstrate our fine art moving ability in a very tricky situation. Stay with us to learn more about Banksy, his incredible creations, and the process of Banksy wall removal as well!